Considering the 911's competition record, it is hard to imagine today that it took Porsche four years to develop the first real racing version of the six-cylinder engined car and then abandoned it after only a handful of examples were built because the sales department feared the 500 examples necessary for homologation could never be sold. Although now forced to run in the prototype class, the 911 R still showed its worth both in rallies and on record runs. Before creating the 911 R, Porsche did offer substantial support to customers who wanted to take their 911 circuit racing or rallying. A special kit to improve the performance of the flat six engine proved particularly useful. Even in near standard specification, the 911 and subsequent 911 S proved very successful on both sides of the Atlantic. Among the many achievements was a class victory in the 1966 24 Hours of Le Mans with a 911 S that was driven to and from the track. The first real factory involvement came in 1966 when Vic Elford asked Porsche to field a 911 S in rallies. He promptly finished 3rd overall in the Tour de Corse and the Rally Monte Carlo and ended 1967 as European Rally Champion. At Weissach, the first order of business was to shed as much as weight as possible from the base 911. The steel shell was retained but all removable panels were replaced by fibreglass examples, the floor boards were extensively drilled and the cockpit stripped from all unnecessary bits including the interior and exterior sound-deadening. Porsche’s engineers were well versed in lightening cars and wasted no opportunity; all hinges were cast in aluminium, the door handles were not plated but left in bare plastic and the taillight units were replaced by small circular lights. Slightly wider five-spoke Fuchs were specified front and rear to deal with the anticipated higher cornering speeds. To clear the 7 inch rear wheels, the fenders were also slightly widened. A more substantial change was the relocation of the oil cooler from the engine bay to the right front fender. The oil lines ran through the rocker panel from the front to the rear of the car. Inside the cockpit, the 911 R boasted lightweight Scheel seats with a ventilated example for the driver. Further changes included a 10,000 rpm tachometer and a Monza steering wheel. The completed car tipped the scales at little over 800 kg compared to 1,070 kg for the production 911. The 911 R was powered by the Type 901/22 flat six engine, which was closely related to the one used in the 906 and 910 sports racers. The all-aluminium unit featured twin-spark ignition and a pair of triple Weber carburettors. It produced 210 bhp, which was 30 bhp more than the 911 S fitted with the high performance kit. Some cars were also fitted with Bosch mechanical fuel injection. Porsche also experimented with a twin-overhead camshaft flat six, which was effectively one half of the 917 twelve cylinder engine. This Type 916 engine produced 230 bhp and could rev to 8,200 rpm instead of 7,200 rpm. After four prototypes were built in Weissach on existing 911 S chassis, production switched to the Bauer factory where a further 20 examples were constructed in September of 1967. The sales department then halted the project as they did not believe they could sell 40 examples per month of the new competition car. The competition department did not give up on the 911 R just yet and campaigned the car in select events even though it was forced to run in the prototype class. Ironically its main competition were the purpose-built Porsche 906s, 907s and 910s. The Porsche 911 R made its competition debut at Mugello early in 1967. Vic Elford and Gijs van Lennep finished a commendable third behind two works Porsche 910 sports racers. An experimental example fitted with a Sportomatic gearbox was next raced in the Marathon de la Route by Jochen Neerpasch, Hans Herrmann and Elford. The three experienced drivers won the 84-hour event on the combined Nord- and Südschleiffe of the Nürburgring. In 1968, the four-cam 911 R was wheeled out, which proved very fast but fragile; the car was so light and powerful that it frequently jumped over the bumps, which caused regular driveshaft failures. In November of 1967, the first production 911 R was driven to Monza for a series of high speed record runs by a Swiss team. They had originally earmarked a 906 for the effort but they found the very bumpy banked track suited the production derived 911 R much better. They went on to set a total of 19 world records for two litre cars. Among them was an endurance run of 20,000 km, completed with an average speed of 209 km/h. For longevity a modified gearbox was used with the same ratios for fourth and fifth, so the gears could be alternated. Not known at the time. the engine fitted to the car had already been subjected to a 100 hour test on the bench back in Stuttgart. an even lighter car by offering a case of champagne for each kg removed from the 800 kg target. This ended up costing him seven cases yet it still proved insufficient to fight off the 3-litre, V12 engined Matras. Larousse did finish third behind the pair of French prototypes. Having outlived their use to the factory, the 24 examples were eventually sold to privateers. Only very few of these were raced with no notable results. Whether Porsche was right to suspend 911 R production after just 20 cars were built we will never know but only a few years later the 911 Carrera RS and RSR derivatives proved that there certainly was a market for stripped down, high performance 911s. The 911 R remains as one of the rarest 911 derivatives and it holds the distinction as being the very first purpose built 911 competition car. Today we have the Kyosho 911r. What a fun little car. The details are all there as we all come to expect from Kyosho. The paint proportions and trim are fantastic for 1/64. 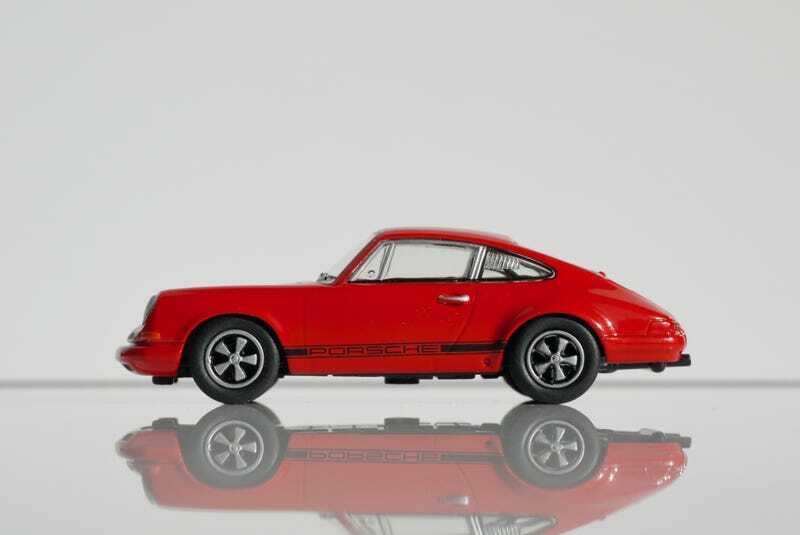 This is one 911 you need if you are a classic 911 collector.